To Keep In Mind these points Mama Earth Brings For Us A Wide range of Traditional Recipes products for Mamas & Mums-to-be which are launched During This Year’s Nutrition Week “1st September – 7th September “! Made with 100% natural ingredients, sourced from the Himalyas, these #TraditionalRecipes from Mamaearth are meant to take good care of the new parents’ needs. Okey So Out Of Six Newly Launched Products, I Received These Two Latest Buddies ..
1) Organic Apple Cider vinegar for Mama . 2) Plant DHA For Mama. So Let’s talk about them one by one.. Losing Weight after Pregnancy is a real big challenge but I found a one best product for Myself .. It’s An Apple cider vinegar . Frankly Speaking, it’s more more than just Ordinary Apple cider vinegars available in market . Drinking Apple Cider Vinegar made with organic apples every morning helps improving metabolism of body and assists in weight loss. Apples are the rich source of Vit. A, Vit. C & Vit. E, enzymes, potassium, magnesium, calcium . Ginger helps break down the accumulation of toxins in our organs. Ginger has been used for thousands of years as a digestive aid as it helps with bowel disorder. It enhances our immune system. Manuka Honey is produced only in New Zealand. It is one of the most unique and beneficial honey in the World. It is rich in antimicrobials. It is very beneficial for our digestive system. Drinking Apple Cider Vinegar with Honey also assists in losing weight. Always shake it well before every use. Dilute 10 ml in 250 ml of water. 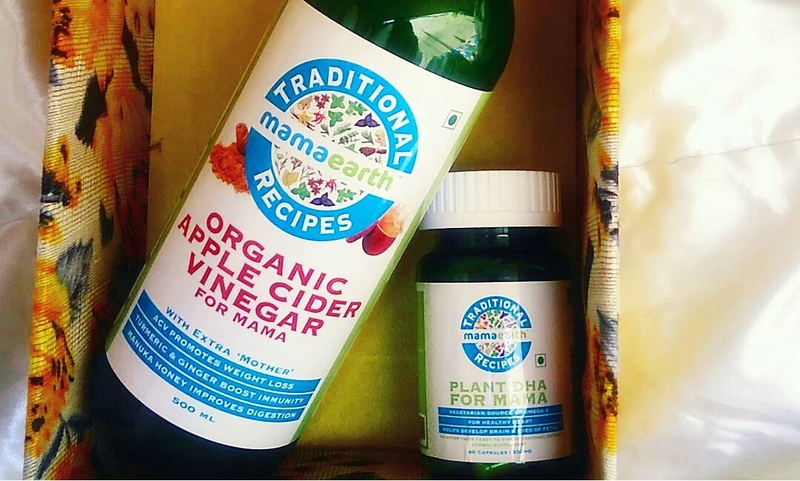 Do not consume anything for 30 minutes before and after consuming Mamaearth Apple Cider Vinegar. Do not consume directly without diluting with water. Do not exceed the recommended daily dosage. It Comes In a 500ml Cute Plastic bottle packaging, Priced At Rs . 599/- & Is Easily Available at Their Official website . It’s boon for Pregnant women. Most of them have a deficiency of DHA. This product is 100% vegetarian & healthy plant-based alternative to fish oils and other animal sources. Its free of contaminants and external impurities. It’s a vital for the brain and eye development of the foetus. Its also support in improving memory, building & maintaining healthy bones. Aids in maintenance of normal brain function throughout life. Researchers found that infants born to mothers with higher blood levels of the omega-3 fatty acid DHA at delivery had advanced levels of attention spans well into their second year of life. During the first six months of life, these infants were two months ahead of those babies whose mothers had lower DHA levels. DHA is rather important for pregnant women, as it helps build your baby’s brain, nervous system, and eyes. A baby in uterus needs to get these fats from its mother. Omega 3 in DHA promotes healthier and stronger bones and joints. Mothers who consume DHA are at a lower risk of developing Osteoporosis than the ones who don’t. Take 1 capsule twice a day or as directed by your physician. Priced at Rs. 699/- It’s Comes 250mg Plastic bottle packaging contains 60 Capsules . 1) Please Consult your doctor/ physician before regular usage ! 2) keep out of reach of children ! 3) Discontinue Use, if any adverse reactions occur ! 4) Store in a cool, dry place ! 5) Best before 2 years after the date of manufacturing ! Mama earth never fails to impress & this time it’s all about a better Nutrition & a healthy living lifestyle. I loved The Entire things about these products the packaging, the better results , it’s easy availability, etc etc. After All A Better Nutrition Is Equal to a Better Mama Further equals to A Better Baby … ?? Iske sabhi products bahut hi acche, chemical free n organic hain ??? ?